The Way Overland… to travel is to live! 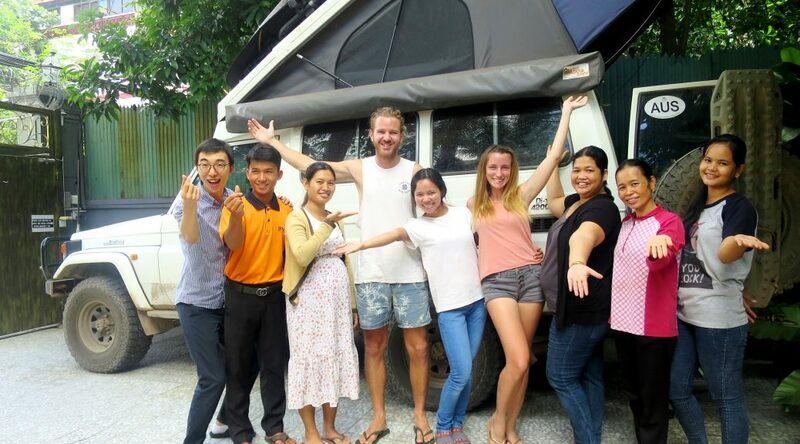 But it seems, to travel overland is to experience it on a very personal level! 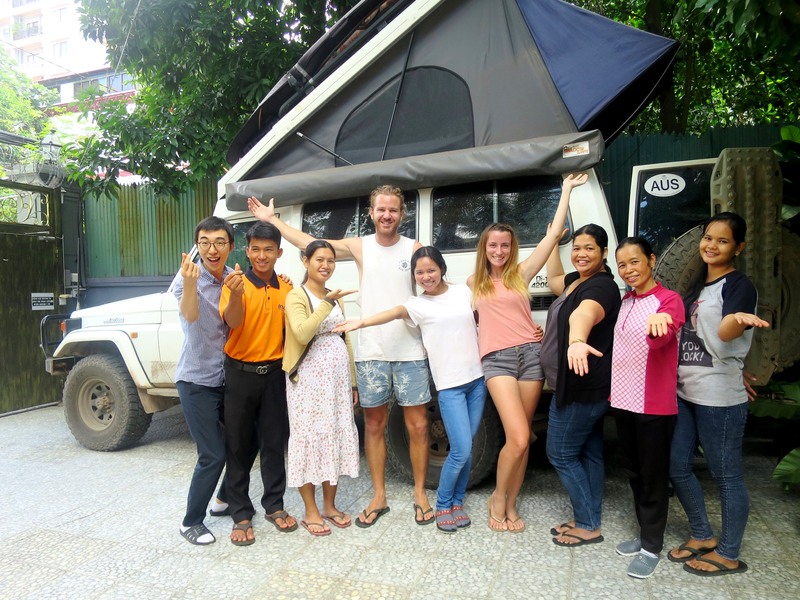 This is what we learnt when we met Mark and Jolie from The Way Overland who stayed at Envoy Hostel while in Phnom Penh! At Envoy, we love travel and being in this industry we see a lot of people who similarly share this passion. However our recent guests Mark & Jolie from Australia have taken the art of travel to the next level! Their mission dubbed as ‘The Way Overland’ (T. W. O.) is to travel all the way to the UK by land in their compact Troopy! Now that sounds exciting! But wait, what is a Troopy? Think of a caravan crossed with a 4WD. A Troopy is a tough, fun and versatile vehicle perfect for adventure travellers like the The Way Overland. As we were curious to find out if it was comfortable to travel in the Troopy, we asked Mark & Jolie to tell us more about it. Of course they were happy to tell us all about it. Mark even gave Chamnab a ‘tour’ of the Troopy 🙂 It’s neat and compact design really impressed us! Clearly, Mark and Jolie can travel in comfort and safety as the Troopy has everything you need plus more! It was surprising how much can fit into this car! It has a fridge, stove, sink even USB ports! We were already amazed! But as we thought it couldnt get any cooler than that, we found out that they even have an upstairs bedroom! Thats right! This sure is the perfect way to travel! Luckily Mark and Jolie stayed while we were trialling our new breakfast menu items. They sampled our new tropical fruit salad and the pandan infused black rice pudding topped with fresh mangoes! And their feedback was…. GREAT! We were so happy they enjoyed the new dishes! As they had a safe place to park on our premises, they ended up staying for one week. We really enjoyed hosting the The Way Overland (T.W.O – but there were actually 3 of them, Mark, Jolie and Troopy 🙂 ). It was sad to seem them leave. However, knowing they will be having many more wonderful adventures we bid them farewell. We hope to see them again one day. Likewise we hope they will stop by at our Envoy Hostel’s in Yerevan (Armenia) and Tbilisi (Georgia) as they cut across that part of the world to reach their final destination. Hope you have enjoyed reading about them! If you would love to find out more or even to follow their adventures check out their website and social media. Bon Voyage Mark & Jolie – Happy Travels to you!